During the 1920's, a sort of garden frenzy was sweeping Southern California. Along with the proliferation of garden clubs, the decade saw the emergence of a new breed - the professional landscape architect. Among these landscaping artists was Lockwood de Forest III, who dominated the field locally for almost thirty years. Born in New York City in 1896, young Lockwood was sent West in 1912 to attend Thacher School in Ojai. He loved it, absorbing classroom learning and the subtle beauty of the Ojai Valley while developing his artist's eye during weekend sketching and camping trips with his schoolmate and best friend, Wright Ludington. After graduating from Thacher in 1916, de Forest went to Williams College in Massachusetts until his college career was interrupted by World War I. While awaiting his army assignment he attended his first class in landscape design at Harvard. After the war (1919) he returned West to attend the University of California at Berkeley, taking several classes in landscape architecture, a field still so new that the studies were offered by a division of the College of Agriculture. Although enrolled for a four-year program, Lockwood de Forest was a young man in a hurry. He left Berkeley after one year, having decided on his life's work and eager to get on with it. However, de Forest was eventually licensed by the state as a landscape architect and became a member of the American Society of Landscape Architects (ASLA). For six months, de Forest worked for Ralph Stevens- a successful Santa Barbara landscape architect who was responsible for the gardens and grounds on several of the area's most impressive estates (see Montecito Magazine Fall 1994 "The Men Who Made Montecito Bloom"). Finding Stevens too inflexible and conventional, de Forest felt confident enough to break free and pursue an independent career. He began by traveling to Europe with his old Thacher school friend, Wright Ludington. Armed with letters of introduction, the two young men were welcomed into a number of great Italian Renaissance villas and gardens. Continuing his travels alone, de Forest studied and photographed magnificent Moorish gardens in Spain, especially noting their design patterns, use of sculpture, and the details of planning watercourses and fountains. The leisurely trip was a valuable learning experience, and he returned to Santa Barbara ready to begin working on his own. From 1920 to 1930, Lockwood de Forest's commissions included a number of large estates in Santa Barbara, Montecito, Los Angeles and Ventura County. Good landscape architects were in demand, and he was already recognized as one of the best. The year 1925 was a landmark for Lockwood de Forest, personally and professionally. He worked with George Steedman, Ralph Stevens and architect George Washington Smith on landscaping plans for Steedman's estate, Casa del Herrero (see Montecito Magazine Fall 1994), to be ready in June. That same year, he married San Francisco-born Elizabeth Kellam. Later in 1925, the Plans and Planting Committee of the Community Arts Association asked the de Forests to begin a regional gardening publication, giving them the munificent sum of $25 toward initial expenses. Their Magazine, The Santa Barbara Gardener, carried articles on every aspect the subject, many written by nationally known horticulturists. Published from late 1925 until 1942, when it was discontinued due to Lockwood de Forest's World War II service, the Gardener began as the only magazine of its kind in the state and ended as a popular, widely mimicked periodical. Although fiercely devoted to his work, Lockwood de Forest stayed active in community affairs throughout his career, finding time to teach courses at Santa Barbara State College (now UCSB). When it was located on the old Riviera campus, and act as an advisor to city and county planning groups. A favorite project was the Santa Barbara Botanic Gardens where he donated his time and skills and was an active contributor throughout his life, beginning with the original planning of the gardens. From the outset, de Forest deliberately kept his office small. He preferred the simplicity of dealing with clients himself, drawing his own plans, making all design decisions and monitoring work crews closely. He liked to do explanatory drawings on the job site, stuffing them into car casually-often unsigned-because he had no patience with fancy plans or pretensions. One of the most intriguing aspects of de Forest's work is the gradual change in his design style throughout his career. While he studied traditional European designs and incorporated those ideas in his early work, he was aware that the times increasingly called for a more modern interpretation of landscape architecture. His designs departed from the traditional as he became convinced that each site should inspire its own natural landscaping, rather than have an arbitrary style imposed upon it. The use of permanent shrubs and trees gave de Forest's designs a unique and remarkable quality. 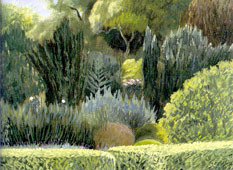 The landscape artistry of Lockwood de Forest is best illustrated locally by the garden design of three fine Montecito estates, as well as the private gardens of his family home. Lockwood and Elizabeth Kellam de Forest made their own home on shady, quiet Todos Santos Lane in Mission Canyon north of Mission Santa Barbara. Her father gave them the land, his father gave money for the house, and Lockwood designed the home, which was completed in 1927. Over the years, the couple developed in their own garden a microcosm of de Forest's landscaping theories. The garden is a secluded spot surrounded by dense vegetation, with a hidden entrance and a secret patio for picnics. In his planning for the grounds, de Forest pushed rocks, earth and heavy plantings to the north end of the property, forming a hill to hide the entrance road from sight. The house is a pale, weather-washed ochre, so deceptively simple in design that it is difficult to encompass al at once. Every room has its own garden, a subtle vista different from the others. The central atrium is just large enough to hold a single, twisted flowering almond tree; one wall is covered with Persian tiles. Light from the glassed-in atrium brightens the lawn and upward to a "framed" view of the Mission Ridge Peak-a technique that soon became a de Forest trademark. A visitor familiar with Lockwood de Forest's feeling about lawns might be surprised to note one at his home- but it is a lawn of South African kikuyu, a prickly brown grass that only greens up during long periods of rain. In the late 1920s Wright S. Ludington, de Forest's Thacher schoolmate and friend, inherited a large Montecito estate. Named Dias Felices (Happy Days) and built for the Dater family by architect Bertram Goodhue, the estate was renamed Val Verde (Green Valley) by Ludington, who was determined to transform the place with the help of de Forest. Both men were artistic, innovative, and quick- creative equals who worked perfectly together. They agreed that the existing traditional gardens seemed at odds with the natural setting. Together, they began to work out new designs that would integrate all elements of the residence, grounds and location. Val Verde was to remain a continuing preoccupation for the rest of de Forest's professional life, and- even as he worked on other commissions- he never stopped experimenting, fine-tuning and inspecting Ludington's Val Verde. For de Forest, the estate's challenges included an exceptionally vast acreage, existing pools and reservoirs to be used or removed, and Wright Ludington's desire to incorporate parts of his sculpture collection on the landscaping. The landscape plan was complex, aimed at providing a number of separate garden areas that were interconnected with each other, as well as with the pools and the house. Additions to the house gave de Forest places in which to put new terraces and fountains. Stairs were built to bring together terraces on different levels, meandering walls and paths replaced the straight ones, and the native live oaks were emphasized by architecture and complementary plantings. A swimming pool and art gallery replaced an old wooden tank and cement reservoir on a hill some distance from the house. Later in the same area a charming atrium was built to display some of Ludington's Greek and Roman sculptures. Both de Forest and Ludington loved to invent little visual surprises and mysteries. Among these was a strange series of square columns built without tops to suggest brooding, classical ruins. Whereas Val Verde forced Lockwood de Forest to plan ways in which to integrate the parts of a huge estate, Constantia- built on 3.2 acres as a winter home for Chicago's Meeker family- presented the opposite problem: making the relatively small grounds appear much larger. The location and view were both splendid, and the house, designed by Chicago architect Ambrose C. Cramer, was a lovely version of the South African-Dutch colonial style. To solve the problem, de Forest exercised one of his special talents: creating the illusion of space through simplicity, symmetry and tricks of perspective that have been used by artists for centuries. To this end, the house, the garden below it and the large reflecting pool were both connected and separated by a series of stepped terraces between them. The large terrace closest to the house became an "outdoor living room," an effect that had become increasingly favored in California. The only garden areas he used for Constantia were the large one in front, centered by the pool, and two smaller gardens at the side and in the back of the house. A clipped hedge frames the narrow garden and pool area drawing your eye toward the mountains in the distance- an arrangement de Forest used increasingly in his designs (see front cover paintings as an example of this view of Constantia). At Constantia, de Forest's thoughtful attention to detail included his use of plants typical of South Africa wherever possible, and incorporating Mrs. Meeker's favorite shell pattern in to the edging of the flower beds in the Dutch garden west of the house. Lockwood de Forest designed his last large garden in 1946- again for a wealthy Chicago couple, Mr. And Mrs. Sterling Morton. Their house was located near the Meeker estate, with the same general topography and similar vistas. On this project, de Forest apparently worked alone, expanding his use of subtle perspective techniques- this time to satisfy Mrs. Morton's desire to have a more impressive garden than the Meekers! To simulate spaciousness around the reflecting pool, de Forest used two effective artifices: the pool was built narrower at the far end, and a row or trees planted alongside the pool was clipped shorter and shorter as it moved away from the house, all creating the illusion of greater distances. Even the palms in front of the pool served to heighten the drama of the scene, keeping the viewer's gaze centered on the pool and the mountains beyond, effectively framing the magnificent view and drawing the viewer's eyes toward the distant scene. In this last- and possibly his best- landscaping masterpiece, de Forest followed his long-held beliefs, using plants natural in form and more in harmony with their surroundings than close-clipped hedges ever were. Except for the pool, there is an obvious lack of garden architecture that further enhances the natural plantings and frames the mountain view. The effect was dramatic, confident and fully modern. After de Forest died in 1949 at the age of 53, Elizabeth Kellam de Forest completed all existing professional commissions- with the help of de Forest's former student, Richard Brimer. She became fully licensed in the early 1950's, and continued to act as a garden consultant until her death in 1984. The home is now occupied by Carol and David Geyer, who moved in three years ago. Carol Geyer- the artist whose paintings appear on our front cover and illustrate this story- feels that her work has gained inspiration from the home and gardens. She has already shown "Flowers from the de Forest Gardens" in a Lost Angeles gallery and plans to concentrate on an intimate study of the gardens. Especially delighted by the long-dormant plants and bulbs brought out by recent heavy rains, Carol exclaims, "There are surprises all the time- I can't believe the profusion of life here. How grateful I feel toward those talented people. I'm honored to be living in their home!"